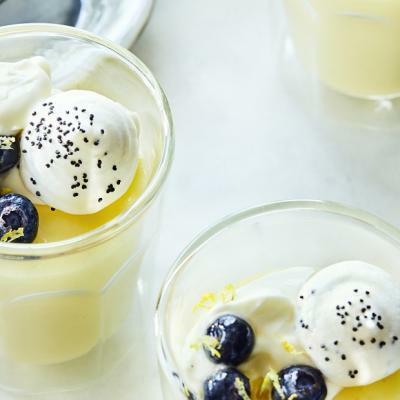 Here is a dessert that is both stunning and comforting. 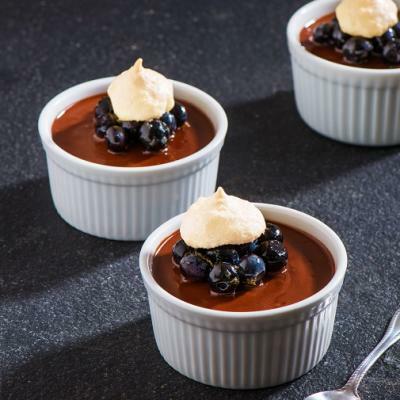 This recipe from Chef Patrice Demers is delicious and will surely become a classic in your kitchen. Place the chocolate pastilles into a bowl and set aside. Beat the 2 cups (500 mL) of cream with an electric mixer until very soft peaks form. 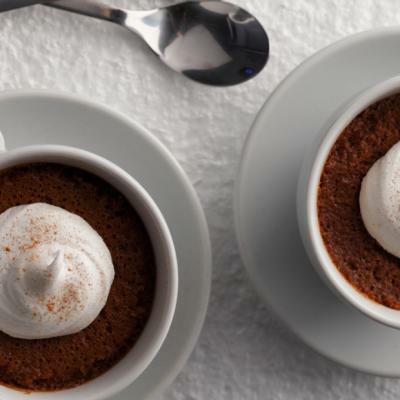 It is important not to over whip the cream, otherwise it will result in a chocolate mousse that has a drier texture once in your mouth. Set aside the cream. In a saucepan, bring the 1/2 cup (125 mL) of cream, milk and half the sugar to a boil. In another bowl, beat the egg yolks and remaining sugar with a whisk until well blended. While continuing to whisk the yolks and sugar, gently pour the hot cream mixture over the egg yolks to gradually temper them. Return everything to the saucepan and cook over medium heat stirring constantly with a spatula (or a wooden spoon) until the cream coats the spatula (or spoon) or reaches 179.6°F C (82°C) if using a candy thermometer. Remove from heat and strain the cream through a fine sieve directly onto the chocolate pastilles. Make sure that they are well submerged in the custard and let stand for 30 seconds. 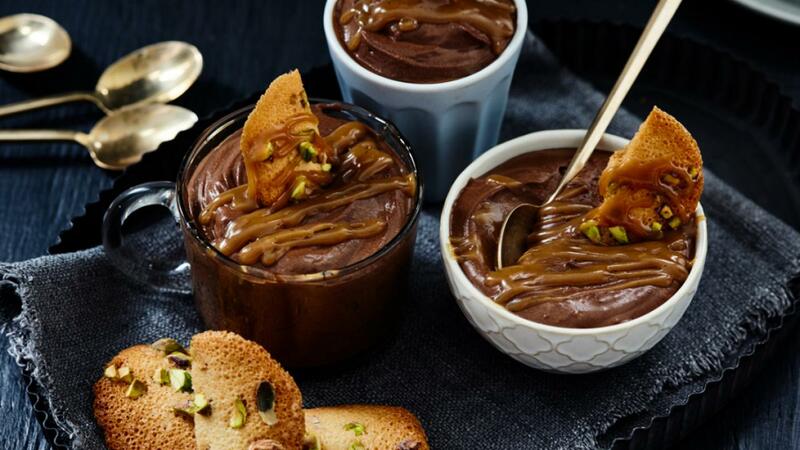 Use an immersion blender to thoroughly mix the custard and chocolate and then pour the mixture into a bowl. With a spatula (or wooden spoon), fold the whipped cream, half at a time, into the chocolate mixture. The mixture should be smooth and uniform. Cover the mousse with plastic wrap and let set in the refrigerator for at least 8 hours. Mix sugar, flour and salt in a bowl. Add liquid egg whites and mix with a whisk to blend evenly. Add the melted butter last. Cover with plastic wrap and let sit in the refrigerator for at least 1 hour. With a small angled spatula, finely spread the wafer dough (a pastry bag can be used for a smoother dough). Generously sprinkle the wafers with pistachios and put in the oven for about 8 minutes or until the wafers are golden brown. While the wafers are still warm, they can be rolled out or curved over a rolling pin. In a small saucepan, bring the cream and salt to a boil. Remove from heat, add the coffee beans, cover and let steep for 10 minutes. Strain the infusion to remove the coffee beans. Combine sugar, corn syrup and water in another saucepan. Cook over high heat, without stirring, until the mixture starts to change colour. As soon as the mixture takes on an amber colour, start stirring to ensure even browning. Keep cooking until the sauce is a medium dark colour. If you are using a candy thermometer, the sauce should be ready when the temperature reaches 363.2°F (184°C). Remove from heat and add a small amount of the coffee-infused cream to stop the cooking process. Gradually add the remainder of the cream and bring to a rolling boil to ensure all the caramel has melted. Remove from heat and add the butter. Stir well to emulsify it into the caramel. Use a tablespoon dipped in hot water to form quenelles from the chocolate mousse and place on a plate. Drizzle with the coffee-caramel sauce and garnish with a few pistachio wafers.